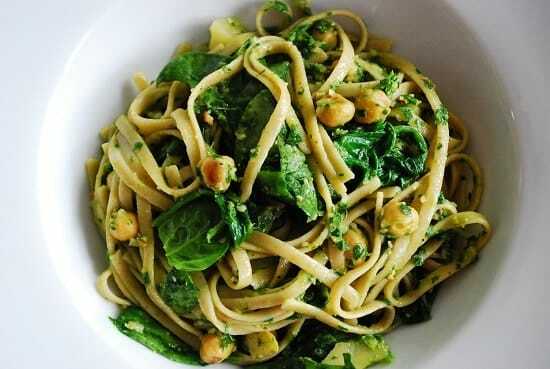 If you are looking to indulge a bit and spend some Points on a seriously delicious and healthy recipe, then this Lemon Spinach Chickpea Pasta with Parsley Pesto is that dish. It’s so beautiful and flavorful, and even though each serving is 10 Points, it’s crazy filling. I found the original version of this Pasta Recipe at The Year in Food, and thought it looked incredible. So I re-made her Preserved Lemon + Chickpea Pasta with Parsley Pesto, and created a version that was much lower in Points, but still had all the divine flavors and textures of the original version. With all the protein, fiber, carbs and nutrients this vegan Weight Watchers recipe has to offer, I didn’t even feel the need to serve it with a side dish. My family enjoyed it for a nice Saturday afternoon lunch, and then we followed it with some fruit a couple of hours later. We were full till dinnertime. A complete meal that’s well worth the 10 Points. This delectable and satisfying Lemon Spinach Chickpea Pasta with Parsley Pesto is not only beautiful and delicious, it’s incredibly good for you too, and is one of the healthiest Weight Watchers pasta recipes I’ve ever made. While pasta is cooking, heat a medium skillet over a medium low flame. Spray with non-fat cooking spray or olive oil mister. Add one clove of the minced garlic and stir for about 30 seconds, until fragrant. Add the chickpeas. Saute for about ten minutes, stirring occasionally. Meanwhile, prepare the pesto. Combine the remaining garlic with 1 tbsp olive oil, 2 tbsp lemon juice, the parsley, the almonds and some salt (I used about ½ tsp). Puree in a food processor until pesto sauce texture is created. Toss the warm pasta with the spinach leaves to wilt them. Add the pesto, chickpeas, lemon zest, lemon juice and gently toss. If a little dry, add some of the reserved pasta water for creaminess. Season to taste with sea salt if desired, along with freshly cracked black pepper. Divide equally into 4 bowls and serve immediately. This was dynamite! Did the pesto with baby spinach and walnuts…added red pepper flake to the chickpeas! Thx for a great low fat pasta receipe! I made this tonight and it is A MAY ZAYNG!!!! Thank you sooo much for sharing this dish. Just started WW this wk and this is for sure going into the dinner rotation menu!! Loved this! I add a little crushed red pepper and fat free feta cheese and it was perfect! I will definitely make it again.